Auginbaugh and Sea View streets; the closest residential intersection to where I had to bail during my training session today due to high winds. I checked the marine forecast and it was the first day all week nothing was posted. I was psyched! It was going to be a wonderful day. My coach was going with me for the first hour or so and getting me on my way for my first circumnavigation of Alameda Island; slightly further than 15 miles. Apparantly the northern tip can be pretty rough by the afternoon and we were going to round that area in the early morning hours. Four of us started together from Jack London Square and we noted how the wind was already up. As we came to the northern tip it was already choppy and as we rounded the tip and headed south there were already some pretty good gusts. It was a really unusual day of wind as it was offshore. My coach was going to turn around at the sea wall where I had a straight shot down the west side of the island. He had shown me on a coastal map exactly where I should go and also where I had to avoid some very shallow waters. Most of the paddle along the island beachfront was OK, not great, and not at all relaxing. I had to really pay attention and be ready to brace at any moment. Prior to reaching the southern tip of the island I was instructed to cut across the channel to avoid very shallow waters with muddy sand bars. This meant keeping a small jut of land to my right once I crossed. Here’s where the fun began. I left the slightly protected water from the land to my left and entered the open channel. At first the wind was to my back but as I turned to port, aiming for my destination, I could not make enough headway before I would get blown into the rocks to my right. I tried a few times but it was clear to me almost immediately I would have to pull out. I looked for the area of smallest rocks I could find and braced myself for getting out as fast as I could. All went pretty well except for the mossy rocks that but me on my a*# the moment I got out of the cockpit. The tide was on flow so I slid my boat well out of the water, grabbed some essentials like my phone and fluids, climbed up to a nice sitting rock, and called for a ride. A disappointing end to my second week of training. 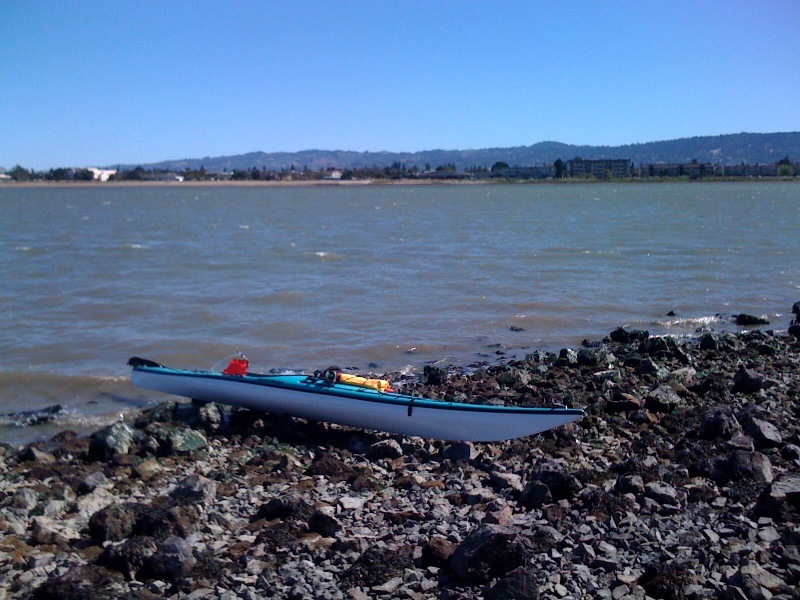 I did get about 10 miles in today but combined with Wed. (5 miles), where I could not paddle due to high winds, I was short about 10 training miles for the week. I guess I shouldn’t worry. I definitely learned some things today to put in my “experience” book. Tomorrow’s a day off with 8 miles scheduled for Mon. This entry was posted on June 12, 2010 by DummyDiva. 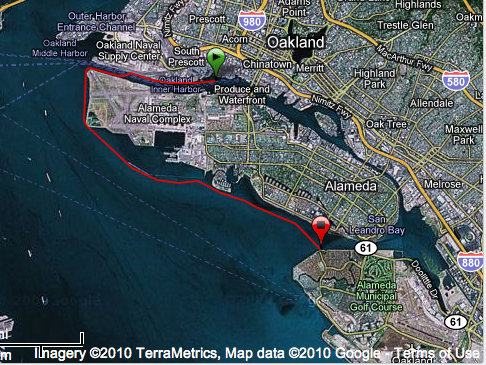 It was filed under Uncategorized and was tagged with Alameda Island, kayaking, outdoors, paddling, training. Im curious, was it wind, or current, or both that were pushing you into the rocks? Shame you had to pull out, looked like fun.